Idiots Rule (Vol. 2) is disc two of an Australian two disc silverback CD bootleg set from Apple House / Banana. 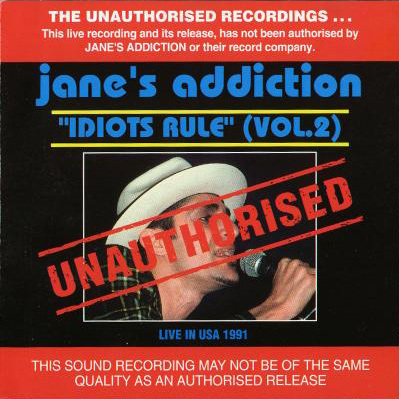 The disc advertises itself as having live recordings from 1991, but this bootleg actually uses a soundboard recording of the Jane’s Addiction concert from October 11, 1990 at The City Square in Milan, Italy. The sound on this disc is excellent, as it was professionally recorded as part of a broadcast on MTV Italy. This bootleg is nearly identical to another Australian bootleg Been Caught Stealing. There are two versions of this bootleg. The first has the red banner across the top and bottom and the “unauthorized” stamp across the cover, the other lacks these labels but is otherwise the same.